Summer wouldn’t be summer without dreamily anticipating sun-soaked afternoons stretching out into long, balmy evenings. But when summer plans can be instantly dashed by an unexpected downpour, the only thing to do is take inspiration from where the summer months are a little kinder, a little more reliable…a little more Italian. During August, Carluccio’s are bringing a little extra sunshine to the table with a free Aperol Spritz with every main course ordered by Summer Pass holders – simply sign up at summerpass.carluccios.com and you could also win a romantic weekend for two in Venice – the heartland of Aperol Spritz. 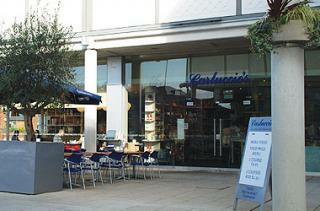 Pull up a chair and savour the great food at Carluccio’s, including limited edition summer specials. Choose from Fritto Misto, a mix of fried calamari, whitebait and courgette served with pepolata mayo; Chilled Roasted Tomato Soup; Risotto Verde with peas; and Ravioli al Limone, pasta parcels filled with ricotta and pine nuts in a lemon sauce. Finish off your meal with a Passionfruit Panna Cotta – it’s almost too good to share! Grab a selection of Italian antipasti and summer drinks from the Carluccio’s foodshop for that impromptu picnic or gathering with friends. Choose from favourites such as Italian Stuzzichini corn bread sticks and Bella di Cerignola Olives that are perfect for sharing; bittersweet Limoncello that ends any meal in classic Italian style; and that sunshine must-have, Aperol. Simply top with Prosecco Santo Stefano for a perfectly balanced, thirst-quenching spritz. Carluccio’s has launched its Summer Pass as part of its La Festa Alfresco, your ticket to enhancing the sun kissed months with little perks, weekly offers and the chance to win some seriously sizzling prizes. Download your Summer Pass here.